May the Priest Saint Paul, whose only love was the Cross, obtain for us your grace, O Lord, so that, urged on more strongly by his example, we may each embrace our own cross with courage. Through our Lord Jesus Christ, your Son, who lives and reigns with you in the unity of the Holy Spirit, one God, for ever and ever. St. Paul of the Cross: Outstanding Example of the Reparative Character of the Night of the Spirit | Reginald Garrigou-Lagrange O.P. St. Paul of the Cross devoted himself to the service of the poor and the sick. He is best known for his apostolic zeal and his great penances. He founded the congregation of the Passionists. According to the 1962 Missal of St. John XXIII the Extraordinary Form of the Roman Rite, today is the feast of St. John Cantius (or Kanty), one of the patrons of Poland. In the Ordinary Form, St. John's feast has been moved to December 23, and is an optional memorial. Historically today is the feast of St. Irene, a Portuguese nun who was martyred in defense of her chastity in the year 653. Her shrine, the “Santarem,” has played a key role for the great quality and beauty of the Catholic Faith that the Portuguese people have lived, even until today. 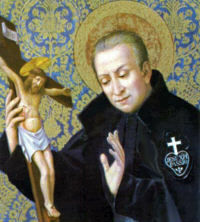 St. Paul of the Cross was born at Ovada in the Republic of Genoa on January 3, 1694. His infancy and youth were spent in great innocence and piety. He was inspired to found a congregation, having while in ecstasy beheld the habit which he and his companions were to wear. After consulting his director, Bishop Gastinara of Alexandria in Piedmont, he reached the conclusion that God wished him to establish a congregation in honor of the Passion of Jesus Christ. On November 22, 1720, the Bishop vested him with the habit that had been shown to him in a vision, the same that the Passionists wear at the present time. From that moment the saint applied himself to prepare the Rules of his institute, and in 1721 he went to Rome to obtain the approbation of the Holy See. At first he failed, but finally succeeded when Benedict XIV approved the Rules in 1741 and 1746. Meanwhile St. Paul built his first monastery near Obitello. Some time later he established a larger community at the Church of Sts. John and Paul in Rome. For 50 years St. Paul remained the indefatigable missionary of Italy. God lavished upon him the greatest gifts in the supernatural order, but he treated himself with the greatest rigor, and believed that he was a useless servant and a great sinner. His saintly death occurred at Rome in the year 1775, at the age of 81. He was canonized by Pope Pius IX in 1867. Symbols: Man in Passionist habit, black tunic and mantle, leather belt and rosary with emblem over the heart; cross; book with cross; heart emblem of Passionist order. Make a holy hour before the Blessed Sacrament and spend some time meditating on Christ's passion. Study and discuss the symbolism of the emblem of the Passionists, perhaps making a banner. Learn more about St. Paul of the Cross. One of the apostolates of the Passionist order is preaching at missions, retreats or parish renewals. Try to have your parish arrange a yearly retreat/mission/renewal. take her rightful position in society, sent her to a convent school and then arranged for a monk to tutor her privately at home. "An assiduous pupil and a devout believer, the only times she ever left her house was to attend mass or to pray in the sanctuary dedicated to Saint Peter on his feast-day. A young nobleman named Britald happened to see her on one of these rare outings and fell desperately in love with her. Every time that she went out he waited to catch a glimpse of her, followed her to church, and eventually made his suit known to her; however, Irene gave him to understand that she would never marry him. "Thus rejected, Britald fell into a deep depression and became so ill that the doctors who were called in to tend him gave him up for lost. Hearing of this, Irene visited him and told him that she had refused him because she was no longer free, having already taken a vow of virginity. “Irene returned home and resumed the life of seclusion and study, intending to make her entrance into a convent before long. But the monk who was giving her private lessons proved to be a lecherous scoundrel, and behaved towards her in a manner as dishonorable as Britald's was honorable. “Irene repulsed him and had him dismissed at once; but his lust turning to a desire for revenge, the monk then began to spread slanderous rumors about her. To those who asked him why he was no longer giving the girl her private lessons, he replied that he had left on learning that she was about to become a mother. “This rumor quickly circulated throughout the town and at length reached Britald who, being frank and trusting and unused to lies, believed what he was told. In a passion of rage and jealousy, he hired a mercenary soldier to kill her. Soon afterwards, as she was returning home from visiting an old man who was crippled, the assassin approached her from behind and killed her with a single stroke of his sword. “Her body, which was thrown into the river, was later retrieved by some Benedictines on the banks of the Tagus, near the town of Scalabris. They gave her a proper burial, made known her story, and not long afterwards, so great was the veneration in which she was held, the name of the town of Scalabis was changed to Santarem (Saint Irene)" (verbatim from Encyclopedia). The Benedictines say that the legend as handed down is full of fiction, but the essential facts are certain: She was a Portuguese nun who died c. 653 in defense of her chastity in the ancient town of Scalabris. Santarem in Portuguese means “Saint Irene”, patron of the city. In the Church of St. Irene we can find the Miraculous Crucifix of Monteiraz. Chuch documents relates that the Body of our Lord became alive (like the Miracle of Limpias), Jesus arm came down from the crucifix and embraced a small shepherd girl of the time of the Eucharistic Miracle. The crucifix belonged to a community of the 12 benedictine monks (Abby of 12 apostles) is from the XII century, it is still venerated today. Visit this link to learn more about the Eucharistic Miracle.